Conditions have to be just right to see this natural wonder. Appearing like a mirage when conditions are just right, a small waterfall spilling off the side of El Capitan in Yosemite National Park turns from a misty stream of white water to a smoldering coil of what looks like radiant fire. Officially named Horsetail Fall, this innocuous flow of water is easily overlooked when feating on the mountainous vista of El Capitan. To see it transform into the Firefall takes patience and luck, affording a rare visit for just two short weeks a year. The fall itself only flows when the snow has built up enough and begins to melt. The snow conditions also have to line up with the las two weeks of February, when the Sun shines just right across the edge of El Capitan to illuminate the water. The sky itself also has to be very clear for the light to react correctly. 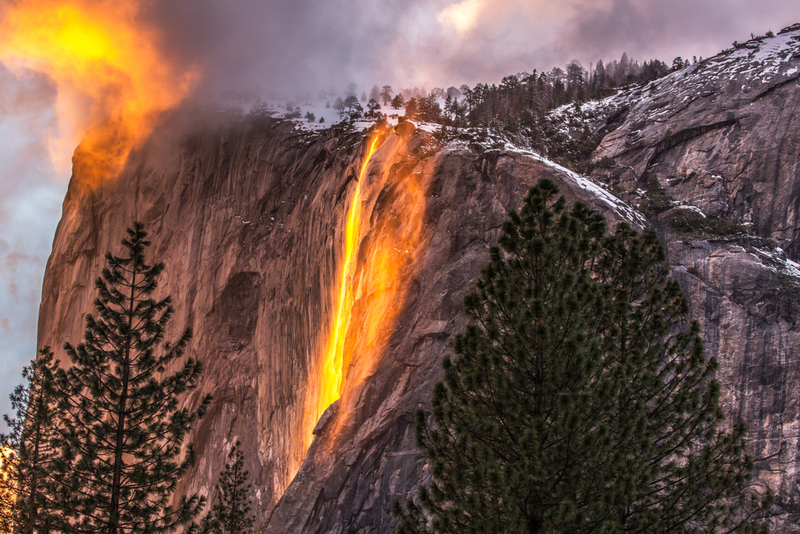 The temperamental conditions of the Firefall meant that very few knew about it for decades. Renowned National parks photographer Ansel Adams snapped images of the fall in the mid-century, but because he used black and white, historians aren’t even sure he knew the flow turned red. It wasn’t until the 1970s that the first picture of the Firefall is known to exist, but, since then, photographers from all over the world have gathered each February hoping for a chance at seeing the Firefall for themselves. Onlookers note that the water doesn’t just look like it’s being cast in red light, but seems to glow. Though only a trickle of water is necessary to pick up the sunset’s color, 2018 was a paltry year. Extended drought reduced the flow to just drops, stunting the Firefall. Next post How Many Spiders Are You Swallowing While You Sleep?